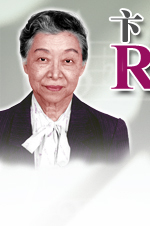 The University Library System of The Chinese University of Hong Kong wishes to express our greatest gratitude and deepest appreciation to Professor Rulan Chao Pian (1922-2013) for generously donating her entire collection of research, fieldwork, and teaching materials to the University Library System. Two batches of her donations were received in 2006 and 2010 respectively. Donated materials include manuscripts, correspondences, diaries, photos, teaching materials, notes, over 7,000 audio-visual materials, more than 6,000 books and journals, and 18 musical instruments, etc. Professor Rulan Chao Pian was Emeritus Professor of East Asian Languages and Civilizations and Music at Harvard University. As cited by The new Grove dictionary of music and musicians (Online), "Pian travelled to China regularly, bringing the latest Western ideas and publications there, and returning to America with a wealth of fieldwork data and audio-visual recordings, materials that preserve and illustrate Chinese music to American audiences." Pian's collection is one of the most valuable collections on Chinese Music in the world. As an inquisitive field-worker, Professor Pian has established her collection over a half century. Started in the 1960s, she regularly visited East Asian countries not only to collect books, musical instruments, and tapes, but also to record performances, events and interviews, carrying bulky recorders and cameras. The greatest part of the collection consists of photographs, rare books, and books, ranging from the disciplines of ethnomusicology, Western musicology, Chinese languages and literatures to Chinese music, East-Asian music, and World music. The collection also includes the open-reel recorders and video machines purchased and preserved by Professor Pian which were the latest and advanced models in the old days, and a few musical instruments collected by Professor Pian and used in her teachings. The enormous collection of audio-visual materials comprises commercial and non-commercial recordings of Peking Opera, revolutionary model opera, Chinese narrative music, East-Asian music, and Western music. The materials also cover Pian's teaching materials at Harvard University, Pian's family and private gatherings, and important scholars' speeches such as the late chancellor of National Tsing Hua University Mei Yi Qi 梅貽琦 (1889-1962), the sinologist Yang Lien Sheng 楊聯陞 (1914-1990), the Kunqu expert Chang Chung Ho張充和 (1914- ), and the Chinese classics professor Ye Jia Ying 葉嘉瑩 (1924-). In addition, it includes recordings of her father Chao Yuen Ren 趙元任 (1892-1982) and her mother Yang Bu Wei 楊步偉 (1889-1981). Those most well known ones are Chao's Mandarin teaching in the early twentieth century and Yang's poetry readings. The audio-visual material collection contains over 7,000 items. The commercial recordings have already been fully cataloged and are now available at the library online public catalogue (http://library.cuhk.edu.hk). The conversion project of the open-reel tapes into digital format has been completed. The collection donated by Professor Pian captures the social, cultural and political lives of the time, and constitutes an invaluable reference source for musicologists, scholars, researchers, as well as performers. For more information concerning access and use of Pian's Donation, please email to music-rulan-pian@lib.cuhk.edu.hk.